The new and updated iWork and iLife apps for iOS and Mac are now live in the App Store and Mac App Store, respectively, and are now available to download. More details and direct download links can be found right here. It’s been a big day for the folks at Apple. As if launching new iPads, new iPad minis, revised MacBook Pros and giving further details of the Mac Pro wasn’t enough, the company also launched a major new version of the operating system that powers all of its Mac computers. That alone would be a big day for most companies. But this is Apple, and as if getting all of that done wasn’t enough of a challenge, it has also launched some significantly updated versions of the apps that make up its iLife and iWork suites. And not just for the Mac either, because iOS is also getting refreshed applications in order to try and keep up with what some of the App Store’s 3rd-party developers have managed to do on the back of iOS 7. So, Apple today announced new iWork and iLife apps. But beyond actually announcing them, Apple has just made them all available to download via the Mac App Store or the iOS App Store too, meaning those eligible for free versions of the apps or indeed free updates can now head on off to the relevant stores and get the downloads running. And they should; both the Mac and iOS versions of the apps in question have received significant updates, and updates are always good! Probably the most noticeable change, beyond new icons, is the general UI redesign that both the Mac and iOS versions of iLife and iWork have received. On iOS especially it’s clear to see iOS 7 influences here and there, and gone is the chintz that made the iPhone and iPad apps in particular feel a little dated. The beauty here is definitely more than skin deep though. Under the hood, all iOS iWork and iLife apps are now 64-bit, making them the perfect partner not just for iOS 7, but for the iPhone 5s, iPad Air and iPad mini devices. GarageBand received a sizeable update on both platforms too, with the iOS version now allowing users to include up to 16 tracks in a project – an increase on the 8 that were previously supported. In fact, those with 64-bit devices will be able to knock that up to 32 tracks. Apple also made a big deal of iWork and iLife’s iCloud interoperability, with iCloud syncing making real-time collaboration a possibility as well as ensuring that the latest versions of your documents and projects are always with you. On the Mac, Pages and Numbers have received some new features. Pages for example now features a context sensitive side panel that will change depending on what is required of it, and Numbers can now offer interactive charts to those that want them. New animations and the like are also worthwhile additions, if a little mundane. Less mundane is the new Drummer feature in GarageBand for the Mac. As the name might suggest, Drummer offers musicians an array of drum profiles with more available to buy as an in-app purchase should the need, or want, arise. 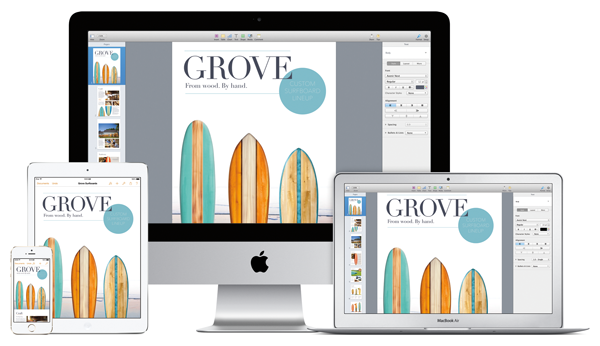 Both the iWork and iLife suites have been updated today and are currently rolling out to App Stores worldwide. Both are also free with the purchase of a new Mac or iOS device. If you don’t fit into either of those categories, and haven’t bought the apps in the past, then you’re going to need to pay, unfortunately. If you’re a heavy user of either suite of apps though, you’ll want to get the updates sooner, rather than later.